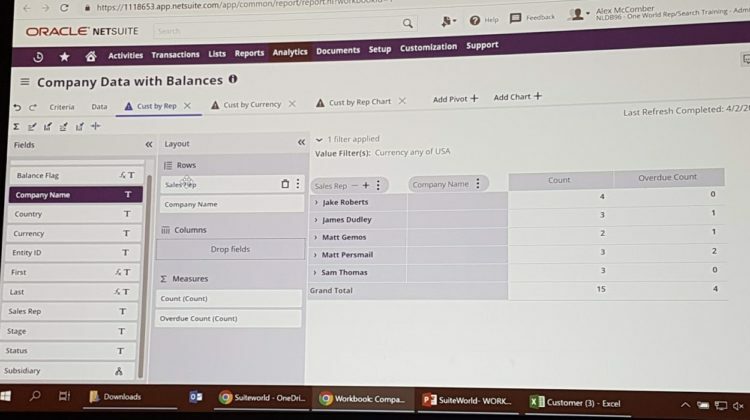 Last week at SuiteWorld 2019, Oracle NetSuite announced the release of their updated SuiteAnalytics Workbook tool. It is designed to draw insights out of this vast dataset and float critical information without users having to go and search for it. Workbook surfaces the information that users need when they need it and filters out the noise. The tool also highlighted the advantages of an Enterprise Resource Planning (ERP) system where all your data is interlinked in a single database. You can combine financial, operational and marketing information into a single report and analyse the performance of a product, understand the behaviour of a customer or make operational decisions. If you were using an ecosystem of apps, you would have to export data from several systems and combine it in Excel or in another tool. Even then you would still have to align data from different sources – and that is not always possible. Consider for example the popular Shopify-Unleashed-Xero setup. Even if you pull data from all these apps into a database, the sales transaction in Xero does not link back to the product (it is just a textual description on the invoice line). The Shopify transaction number is not on SOH/COGS movement in Xero, and payments don’t link back at all. With a Shopify-DEAR-Xero setup, SKUs do carry across all the way but not the internal product keys. So if an SKU changes, you will lose some of your reporting capabilities. So you can see how it can get very tricky to really create an interlinked database. ERP systems don’t have these problems because they manage all their data in a single, well-structured database. There is none of the data loss that occurs in the integration points in an app ecosystem scenario. NetSuite, as an ERP, has a central database so you can focus on analysing the data rather than spending time collecting and cleaning it. The new Workbook let you create lists, pivot tables and charts in a manner that is somewhat similar to Excel. It also reminds me of tools such as Microsoft Power BI and Zoho Analytics because of its interactivity and the database nature underneath it. You can drag and drop fields from anywhere in your database: your customer records, sales orders, purchases, general ledger, staff, product database and more. Your entire database is available for reporting. The chart types and functions include the usual pivots, pies and bars. It also has data science functions to identify trends and data clusters. You can really start using analytics as a tool to explore and study your data rather than just as an aggregation tool which is the traditional reporting approach. The user interface seems relatively simple to work with: graphically building formulas and logical (and/or) conditions, dragging fields in or out of the report, and validating the report functionality on live data, all on the same screen. Formulas created once can be used in multiple reports and charts. You can click on all figures, bars, and data items to view the transactional data underneath. All reports export to CSV. Since we have an integrated, interlinked set of data, we can report on one area and inspect data from related records. For example: if we are reporting on products, we can explore the industry distribution of the customers who buy them. If we are reporting on our top profitable products, we can investigate the size, location, and pricing models of the suppliers we source them from. When reporting on KPIs for sales staff or service staff, we can bring in data from our payroll and HR areas. This will show correlations between staff performance and their remuneration structure, attendance, billable hours, KPIs, or duration of employment. With access to business-wide data, we can find out not just our best-performing products, services, staff, customers or suppliers. We can also explore the factors driving this performance, what characterises them and how to generate more star performers like them. When we create a report, we often have to first ‘prepare’ the data. That is, round certain figures, clear out irrelevant values, split or concatenate fields, and code data into meaningful values (e.g. code a number field into categories like low, medium and high). The NetSuite Workbook lets us set up these data preparation functions inside the workbook, and the ‘prepared’ data is now available for charts, pivots and lists. The data preparation rules operate on live data whenever we run the report. This can be a huge time saver compared to manually repeating the preparation processes whenever we want to run the report on a fresh set of data. All the Workbook and reports in NetSuite can be shared inside the organisation with individual users, user roles or placed on specific pages and forms. Lists and charts can also be added to role-based dashboards so they are always visible to those who need to keep an eye on them. Overall, my impression is that Workbook is a powerful tool, definitely beyond anything we are used to seeing in the small business apps world. The reporting limitations are very apparent when you use a combination of Xero/QBO and some of their add-ons. Am I suggesting that you take on an ERP system for the sake of better reporting? Not at all. ERPs have many advantages, but they also have their liabilities. In most cases, my approach is that the justification for an ERP system should come from the operational needs of the business first. Financial and analysis requirements come second. Disclosure: Inbal Steinberg travelled to NetSuite SuiteWorld in Las Vegas as a guest of NetSuite. Oracle NetSuite has launched a free research and benchmarking service that draws on anonymised data from 16,000 companies using its ERP (enterprise resource planning) platform. The service, called Brainyard, will “give everyone across the technology ecosystem equal access to the research, data and practical advice needed to grow and run a business”, the company said in a press release. The service would challenge research firms that marketed “expensive” benchmark services built on proprietary data. At this point, Brainyard is a website featuring industry stats, KPIs and benchmark information across 12 industries. The industries are advertising; apparel, footwear and accessories; consulting services; food and beverage; manufacturing; media; nonprofit; publishing; retail; software; technology services; and distribution. It neatly shows the data on NetSuite’s spectrum of growth stages from foundation to transformative. A business can see where it falls on that spectrum. Brainyard includes educational material that gives meaning to the figures, introduces key concepts, and explains what drives different metrics. A sample of articles on the site include “Top 7 Benchmark KPIs Every Restaurant Owner Should Measure”, “How Wholesalers are Turning the Amazon Threat into an Opportunity”, and “What Growing Retailers Should Know About Multi-Currency Ecommerce”. Brainyard also educates on KPIs. For example, it explains what DSO is (Days Sales Outstanding) and how it is influenced by Days to Invoice and Receivable Staff FTEs. Understanding the drivers can give you clues as to how to improve a certain metric. Brainyard is free and publicly available. You can use it to get a sense of how your business is doing and to learn about how you could improve specific aspects. NetSuite uses the Brainyard information in semi-annual reviews with clients. But those of us who are not NetSuite clients can still use the data for our own reviews. In the future, I believe that this data will be embedded in the NetSuite app. So when you are working on some modelling you can see relevant industry KPIs. And when you are preparing a proposal you can see standard margins from businesses similar to yours. 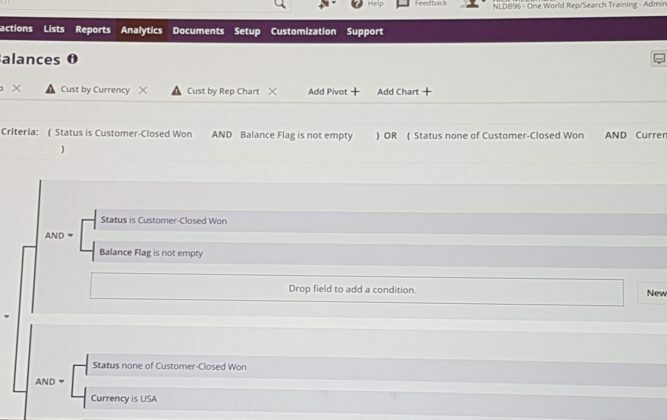 On a side note, NetSuite showed a fantastic machine learning-based function in SuiteWorld 2019. The ERP shows your internal metrics to assist in your decision making. For example, when you prepare a proposal, it might come up with margin information on similar past proposals, or advise that the staff member you allocated typically delivers over budget and you may need to increase the quoted hours. All this advice is based on analysing your internal data. I believe that as a next step NetSuite will extend this function to show you information from your own history, alongside industry stats and benchmarks. The data in Brainyard is global. You cannot filter the stats for your region, and I am not sure what geographical area is included in the third party research that supports Brainyard. Brainyard also “speaks” American. In retail, for example, it talks about sales per square foot. Not perfect for us in Australia, but still, informative and interesting. Finally, it seems frustratingly incomplete. The data cannot be filtered at all, whether by business size, business age, geographical region or other parameters. I am sure that there are significant differences between the ratios of a $20M business and those of a $200M. The internal wiring, structures and overheads are just not the same. I am also not comfortable with NetSuite referring to Brainyard as “a tool” At the moment it is a static website with very interesting information. A tool suggests more interactivity an ability to plug in your own figures and monitor them over time, and more activity rather than a dump of passive data. Overall I love the culture of openness NetSuite is showing in publicly sharing information and knowledge. Keen learners can make a lot out of it. I feel that it is worthwhile keeping an eye on Brainyard to see if it continues to evolve with more data, more filtering options, more interactive analysis options and more educational material. ERP software companies have wanted to crack the SME market for a long time, yet rarely invested in more than marketing. Now, however, they are changing products and customising deployments to fit the appetite and wallets of small businesses. Oracle NetSuite, a well-established cloud ERP provider, is heavily promoting its SuiteSuccess initiative. Make it easier for small businesses to get started with their ERP. Promote the growth of businesses using NetSuite so they consume more and more of the ERP platform. Getting started with an ERP used to mean going through discovery sessions and heavy customisation projects. SuiteSuccess aims to minimise or avoid that expensive consulting exercise entirely. SuiteSuccess editions are pre-configured for industry and region. In theory, you could simply migrate your data, train your team, and get started with no customisation at all. The editions include wholesale, retail, and service, and sub-industries such as food and beverage, and health and cosmetics. In each edition, NetSuite has removed any irrelevant fields, added industry-specific data, created relevant user dashboards, user roles, forms and flows, configured reports, and even customised the data import templates. SuiteSuccess also contains a set of leading practices for every industry process. These are step-by-step workflows for collecting data, defining staff roles, and approval processes. This process documentation is available as educational PDFs with flowcharts and lists of steps, and it is also accessible from within the ERP. When you are working on a specific transaction, you can click a link to the relevant leading practice. I haven’t had a chance to review these processes in depth yet. When I do, I’ll be curious to see if the analysts who composed them remained faithful to the idea of keeping it relevant to small businesses, or if they ended up generating big-business process documentation. If NetSuite’s customers experience healthy growth while on the platform, everybody wins. The company gains revenue and profits, and pays NetSuite for using extra features or adding more users. So NetSuite developed a set of growth stages for each industry that identifies opportunities for growth and how to go about achieving them. NetSuite claims to be proactive with their clients through regular reviews designed to identify indicators of these growth areas and whether the client needs to expand into new features of the ERP. NetSuite then lays out the blueprint for the next step in its “Suite Success Stairway”. basically This could include enabling new modules, forms and workflows, or simply adding extra fields and reports to access a new set of leading practices and let you start playing a bigger game. Of course, no business will fit the model 100 per cent, but it can still give a good blueprint for businesses to work with, learn from, and follow. One of the SuiteSuccess stairways, targeting wholesale distributors. I reflected on the way businesses implement apps and processes in the Xero and QuickBooks Online ecosystems. We are missing just that: blueprints of ecosystems and how they are to be used. The small business app market is somewhat fragmented with businesses having to piece the parts together, working with advisors who are experts in parts of the solution but not in the entirety of it. While Xero has promoted advisors who specialise in particular industries, there are very few successful industry-specific cloud integrators. In Australia, SMB Consultants come to mind for retail and Tradiepad for trades, but I can’t think of implementers who have an end-to-end grasp on food and beverage, constructions, or software across the full spectrum of business growth. They are mostly generalists. Most likely due to the lack of volume in the market, low margins on projects, and the size and maturity of the cloud integrator businesses themselves. For implementers specialising in an industry, I wonder how proactive they are around driving growth after a successful set up has been completed. The issue with growth in a small business app ecosystem is that you can quickly outgrow the ecosystem, and therefore your cloud integrator becomes irrelevant. Not a fantastic model for collaboration. Picking an ERP (enterprise resource planning system) is a daunting prospect. ERPs are not only more expensive than accounting software, they are more complex to set up and operate. Then there is the cost of retraining; an ERP is a business platform usually used by every employee in the company. A quality implementation partner can make a huge difference to the time it takes to roll out the ERP and the speed at which your staff adapt to the new system. An expert panel at SuiteWorld 2019 discussed the best methods for selecting an ERP implementation partner. I collected the panel’s top tips that are most relevant for smaller businesses and added some of my own. Does it have to be a cloud software? Does your industry have specific restrictions that mean it must be an on-premise software? Do you need specialised compliance reporting to meet government regulations? A scorecard is simply a spreadsheet with the screening questions as rows and the candidate apps as columns. Run through the questions and check or score the app for each question. Some implementation partners maintain a database of vendors’ responses by industry. They can then quickly pull up a shortlist for your industry. “People usually buy software that is reasonably good for their business, but most of the failure is in the execution”, says Craig Zampa, consulting principal at Plante Moran. A strong implementation partner will manage changes to the scope of the project. They can also advise on how and when to introduce changes while managing their impact on the original project timeline. One of my personal favourite qualification questions for implementation partners is: How do you manage scope issues and unexpected functionality mismatches during implementation? If their answer is something like: “We scope out everything up front and then it’s smooth sailing”, I recommend not to hire them. The scope will change and issues will come up – they always do. We need to be prepared to manage them. A partner that utters “too easy” is either being dishonest or has never done it before. There is no point looking for a partner that claims to have bulletproof methodology. Look for those who plan well and have the depth of experience to anticipate, identify and manage the issues as they come up. “You can do everything right in the project and still have an imperfect implementation. It is people, process and technology. Not just technology,” says Zampa. The transition period immediately after “go live” is critical. That’s when you come across scenarios you did not anticipate. It’s also when you identify the processes which team members are struggling to adopt. For example, staff may revert to old habits such as referring to spreadsheets outside the system for the latest pricing or for a checklist of codes. Dealing with these issues comes down to being empathetic and helping staff work through the stages of learning new methods. “We are the advocate for the project, not just the client,” says Paul Kininmonth, project delivery manager at Technology Evaluation Centers. You need an implementation partner who has the success of the project in mind, even if the milestones change. A partner’s role is to see out a successful implementation, not just accumulate hours, get paid and move on. You need your partner to understand what you want to achieve, and then challenge you on how it should be achieved. Likewise, a partner is not there just to move data from the old system to the new one. They need to think of the best ways to structure the data in the new systems and ensure you make the most of it. So when you ask for a particular report to be created, you want your partner to ask what you need it for and when it will be used. Maybe what you are really after is an exception notification, a dashboard widget, or perhaps a different metric altogether. You want your partner to think for you and contribute their knowledge. As Kininmonth says, you want your partner to advocate for the success of the project and the business, and not just worry about you liking them. Before embarking on a project of change, consider what you already have in place. One business that called for help was already using an ERP system, but only for finance and not for operations, says Richard Sides, COO of Ultra Consultants. A new system is not a magic solution. If you are struggling with your current systems, you need to make sure that you have really exhausted the options before moving on. Contact the software company or bring in an expert to see if you are using the system correctly. Maybe there are options you were not aware of, or maybe it wasn’t set up properly to begin with. Any responsible implementation partner would ask you these questions before they propose a change to another system. If they don’t, maybe the partner has a vested interest in selling software rather than prioritising the needs of your business. “The good news about ERP is that it’s integrated. The bad news about ERP is that it’s integrated,” says Ultra Consultants’ Richard Sides. With an integrated system, you lose the buffers such as spreadsheets moving between people. The review points and manual processing in those buffers act as controls that need to be rebuilt within an ERP. Now that processes no longer rely on the movement of spreadsheets, an ERP needs to notify everyone when transactions take place. If you blindly replace non-integrated processes with integrated ones, the controls in the business disappear, cracks will appear in the new set-up and things will fall through. People may feel that they are losing control. I once worked with a bookkeeper who didn’t like Xero’s repeating bills because ‘I need to create the bills myself so I remember they happened’. Your partner may need to implement other ways to make sure the bookkeeper is aware of when Xero creates a repeating bill, or better yet, ask why they need to know. If it is to ensure that no bills have been missed, maybe your partner can set up an automated control to check for missed bills instead. ”Make sure that every executive team member is behind the change. We go through that before anything else. Otherwise, it’s a waste of time,” says Shawn Windle, managing principal of ERP Advisors Group. These are the disillusioned words of a warrior who has been there before. If a member of the executive team is not behind the change, the implementation partner will have to deal with their constant objections and reluctance to give the new system a go. It is like trying to navigate a boat along a winding river with one rower drilling holes in the bottom of the boat. It is ok for execs to have concerns and voice them, and partners need to make sure they prepare a well thought response to manage any risks they raise. But everyone in management needs to be willing to support the new system. If they aren’t, as Windle says, the whole project will be a waste of energy and time. For the past five years I advised people to only use Cin7 if it had specific functionality that they required. Otherwise, it was better to opt for other inventory apps simply because they were more usable. Cin7’s lack of usability was simply frustrating. It had functionality scattered all over the place. Like a field that showed up in two pages under different labels. Or the mind-blowing fact that by entering a date in a particular field you had implicitly created an invoice. And where do you then find those invoices? Aha, not as easily as you might think. Founder Danny Ing says that he was aware of this. ”At first we didn’t give (usability) much thought because we thought we were going to automate everything anyway,” Ing said at the company’s recent conference. Now Cin7 has overhauled the user interface and at first glance it is definitely starting to look better. Now this is how you do multichannel! Cin7 leads when it comes to businesses selling through multiple channels. If you have a retail store, why not try listing some of your products on Amazon as well? And what about eBay, Etsy, and other marketplaces? And what if you could easily allow customers to pick up their online orders from the bricks-and-mortar store (known as click and collect)? And the integrations required for selling into big box retailers? Cin7’s idea is that if it is extremely easy for businesses to list products on multiple sales channels, the experimentation cost is low, sales go up, the business grows and it’s a win/win for the user and for Cin7. The company describes itself as “the number one multichannel ERP” (we’ll get to the ERP claim in a minute). To justify that claim they seem to have invested heavily in functionality and integrations around the many channels and in making them usable through central dashboards. I love that Cin7 is busy building integrations. Listening to their integrations developer speak, it is clear that the integrations are deep and thorough. For example, Cin7 now supports Shopify’s multi-location feature by mapping each Shopify location to a Cin7 one. Integration is forever a chasing game. New features in an app become fully valuable only when the integration can reflect the added data in the other app. The holy grail for wholesalers is selling to big-box players like Myers, David Jones, Coles and Woolworths. But when you do manage to get in, you have to comply with very strict requirements around transacting with them, usually through EDI. 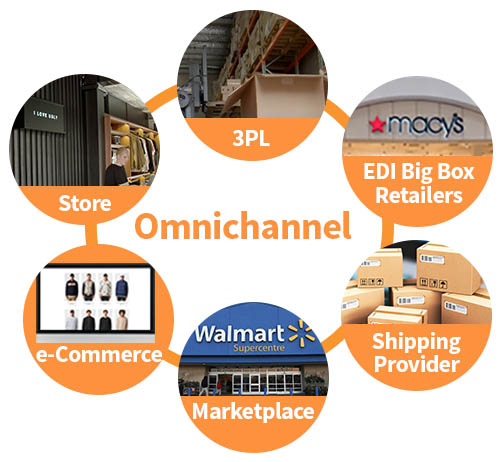 Electronic Data Interchange, EDI, is the protocol through which you must receive big-box retailer orders, inform them of shipments and deliveries, log change requests, and send invoices. You can manually log onto the retailer portal, but better yet, you want your systems to integrate directly into their systems, pulling and pushing information between them in near real-time. Any misses or delays and you get financially penalised or worse – kicked out. Cin7 chose to develop its own in-product integration with most popular Australian brands (some inventory apps use third party EDI solutions). The superpower, in my view, is controlling all those interactions with big-box players in a single, concise dashboard. The technology to play the big game is a superpower for small businesses. The Cin7 team describe their app as an Enterprise Resource Planning (ERP) system. Is it really an ERP? By definition, a business application is an ERP if it has a financial module at its core. Cin7 doesn’t. It integrates with Xero and now with QuickBooks Online (a work in progress). Definitions aside, it does seem to be the most deserving of this title out of all the inventory apps in the Xero and QBO marketplaces. The reason I say this is not for its breadth of functionality, which is similar to the others, but its depth of functionality and the maturity of the businesses they seem to be targeting. All leading inventory apps (I am thinking DEAR Inventory, Unleashed Systems, TradeGecko) have roughly the same functional scope. They all integrate with your website, record your wholesale orders, manage your stock levels and stock takes, and help you reorder stock. But there are differences in the depth they go into. What do I mean by depth? It’s the difference between having a single method of apportioning landed costs to the items in a shipment (usually by dollar value) and giving the user the choice of dollar value, dimensions, weight, or manual allocation. Then there are business maturity functions such as role-based dashboards and the concept of user roles in general. These are not available in all small business inventory apps. There is also depth in productivity functions. For example, branch routing, where you give the system a set of rules and it decides on the best branch location to fulfil each order. You can even split the order to multiple sites rather than manually transferring goods to a single location before fulfilment. I certainly saw some processes today that made me think more ERP than Small Business Inventory. Some of it was commercially available out-of-the-box, some was “Speak to us to enable”, and some was coming soon. But all the same, it shows a strong focus on bigger, more established users. While all of the popular inventory apps handle picking, packing and stocktaking, some of them are introducing a separate warehouse management system (WMS). You don’t need this if your operation uses third-party logistics (3PL). Your 3PL provider will handle that. But it will make a huge difference for companies fulfilling orders in-house. 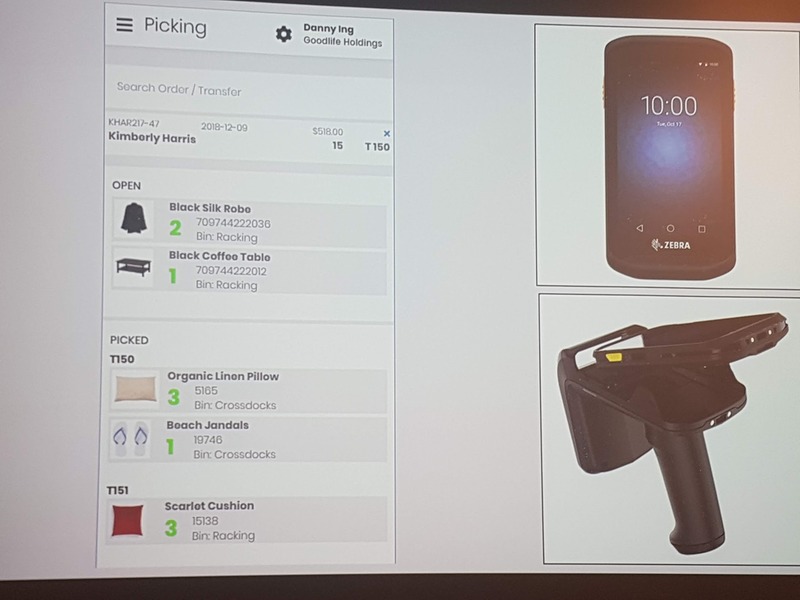 DEAR Inventory released their WMS last year and TradeGecko has a picking/receiving scanning app. Dynamic stock location. This means that the bin location is not set in the product definition, but rather we can place the units of the product in various locations in the warehouse and the system will record that. Integrated scales to weigh packed goods as a safeguard against wrong product packing and to send actual weight to the shipping apps. Stock receipting into racking or cross-docking. Holding stock and creating in-branch areas to allocate stock for certain uses. This is often implemented in simpler systems using virtual warehouses which require manual stock transfers to mimic allocation areas. Packaging, so that the system is aware of packed dimensions and can send accurate information to shipping apps. Batch picking, where you pick from warehouse locations once for multiple orders and then pack them into the different orders as a separate step. All in all, Cin7 is carving a robust path into the realm of ERP. Not sure how the Cin7 team feel about the constraints imposed by small business accounting software, and how they will handle their customers suffering from those constraints. This will be an interesting space to watch. I spent the day in a room full of active users of the software, chatted to them and heard stories of using Cin7 to successfully grow and stories of hair-pulling frustrations. Cin7 staff were available for unlimited, one-on-one catch-ups with users, and the founder (and still the main product architect) was furiously taking notes while chatting to clients in great detail. Overall, it gave me a good feeling about the future of Cin7.